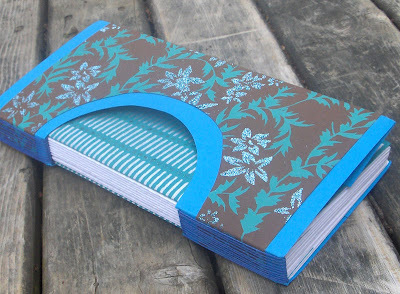 From PurpleBeanBindery, Anna has sent this pretty teal journal for the swap. The cover is made in layers, creating a nice mix of texture, colour, and shape. 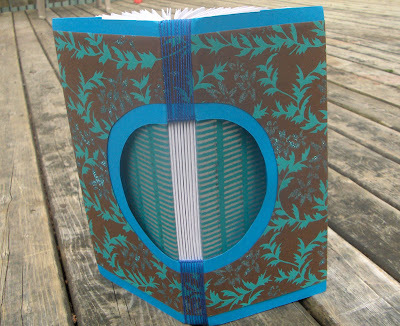 This book is sewn with a buttonhole binding and the pages are a heavy-weight drawing paper. What a gorgeous book! The buttonhole binding is at the top of my "learn to make next" list! And I like that the format is just slightly off the usual. Yes, this is really a beautiful book - so beautifully made. It arrived this week and I love it - thank you!